For a wide selection of my pictures of London from the 1970s on, and more recent publications of work from London see London Photographs. Most collections of London pictures concentrate on the well known tourist attractions. In 1996 I set up my 'Buildings of London' site to show the whole range of London buildings, both the exceptional and the typical, including industrial, commercial, domestic and other types of buildings. This site was updated for the next two years and mainly includes pictures taken from 1986 to 1998, but is now included for historical reasons. Another major site which includes some of my pictures of London is The Lea Valley which covers the River Lea from its source to the Thames and the Lea Navigation. Although this site is centred on London, a few other pictures do creep in. German Indications combines images and text related to my visits to an area of north Germany. The More on the work page includes links to other work outside London, including my most recently launched site, Still Occupied - A View of Hull, launched for a project to celebrate Hull's year as 2017 UK City of Culture, to which I continue to add pictures. 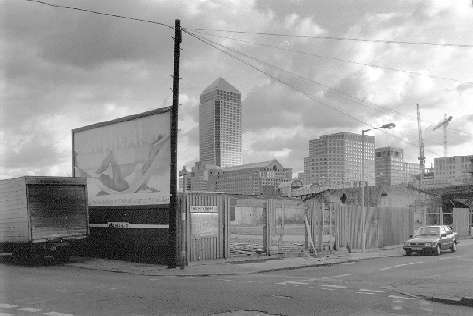 For work from the the 1970s and 1980s showing industrial sites - including riverside warehouses in Bermondsey and Wapping and many other places along the Thames on the 'London's Industrial Heritage site, go directly to the site, and use the built in search facility there. Unfortunately illustrations cannot be included because of copyright restrictions.